What if the internet existed a century ago? It is a simple question with an entertaining answer, as explored by Christian Schneider’s new book “1916: The Blog.” In this lively mix of fact and fiction, Schneider tells the story of his great-grandfather Sebastian, a low-level newspaper typist who in 1916 comes into possession of a futuristic connectivity machine. The typewriter-like device sends written telegraph-style messages to other users through telephone lines, allowing the other users of this secret, experimental technology to read and comment on Sebastian’s musings. 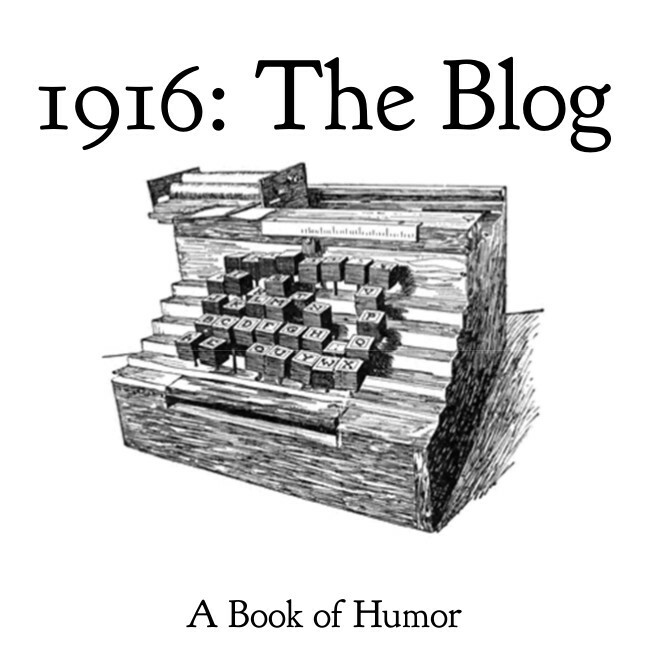 “1916: The Blog” is a knowing satire of the modern internet culture, as Sebastian runs into early-20th Century scams, snake oil salesmen, dating sites, trolls, and conspiracy theorists. The story mixes extensively researched true events from the year 1916 with a fictional narrative documenting the experiences of a low-level newspaper worker in the American Midwest. The book is written in weekly installments, as if Sebastian were blogging as real-world events unfolded. During the year, Sebastian offers his thoughts on the 1916 presidential race, the United States’ impending entry into World War I, America’s manhunt to find Mexican outlaw Pancho Villa, and the soon-to-be imposition of Prohibition – all without the benefit of a long-term historical perspective. In this sense, he is offering hyperbolic, real-time opinions without complete information, a characteristic that frequently fails to elude today’s modern bloggers. But most of all, “1916: The Blog” is a funny look at how we have all both changed and stayed the same over the past century. Briskly written with airy language, it offers sharp insights into what promise the internet still holds, and serves as a cautionary tale as to how the gift of interconnectedness is bound to go horribly wrong when real human beings get involved. Human nature will always be human nature, whether it’s 2016 or 1916. Chris LOVE your articles. BUT you are NOT old. Keep sending the movies! Say Hi to Morgan and the kids! PS I am so proud of you! You used and use pseudonym Dennis York? Why hide who you are? You harm humane, courageous human beings who worked and work to save America’s middle class–what is left of it–and 2 other classes from Russia’s extremely racist elite in its secret police and military: Russia’s elite (Putin and pals) are mega racists–like Hitler was, and those under Hitler were–against all other ethnics. Beginning in April 1989, I suggested to key Hungarians–when they were on a ‘Friendship visit’ to Finland–that they, while they and other east Europeans were under Russian control, dare open up 2 gates on their borders; one gate on border with E. Germany, and other gate on border with Austria. Amazingly In Aug. 1989 they did. First some 200 E. Germans went through gates through Hungary in that summer 1989 to Austria, the West and freedom. The E. Germans were watching. But Gorbachev did not order Russian troops into Hungary to stop E. Germans escaping to freedom as happened when Brezhnev ordered Russian troops into Hungary to quell Hungarian Revolution in 1956.